Are you interested in where IPS Systems (Intrusion Prevention Systems) are going over the next few years? Do you think we'll see more HIPs (Host Intrusion Prevention Systems) feeds into IPS consoles, or more integration with SIEMs? Or will we just see better versions of what we have today? Or are you maybe just wondering if your organization needs an IPS? Looking forward to your views ! It'll be interesting to see what the final document will look like when it's released in November, and what happens when QSA's turn the PCI guidance into audit findings and recommendations. With one "extracurricular" project winding up, I figured it was time to start the next one, and playing with the new crop of GPUs for hash and password cracking seems like a fun way to go. At first glance, using specialized hardware like a GPU would mean that you'd be working in a physical machine, that using a VM is not in the cards. Not so, it's actually pretty easy to make it fly in a VM, with a bit of planning. For me, it also means that I don't need to find a spot for a new server. A motherboard and CPU that supports Vt-d. I'm using a Tyan board and a XEON E3 processor. If you plan to use more than one GPU card, be sure the system board has enough slots, and that they are far enough apart (GPUs generally take 2 slots). Also, with more cards, a tower configuration will tend to overheat the top card(s) - be sure you have lots of fans in the case, and try to end up with the cards mounted vertically after all is said and done. Be sure you've got a power supply with lots of connectors and power - the card I ended up buying needed both an 8 pin and a 6 pin PCIe power connector. I've got a 650Watt modular power supply to play with in this machine, so all is well. For folks like me that are on a budget, there are two main choices in GPUs - NVIDIA and AMD. While both of these cards perform great for graphics, the AMD has and edge in crypto work - it seems to have better integer computing support, so tools like Hashcat or John the Ripper tend to run quicker. 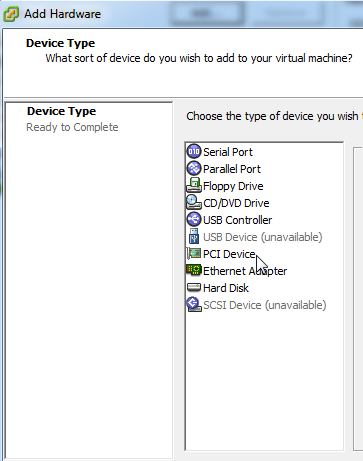 In a virtual environment, the AMD cards seem to work better with Vt-d (called Device Passthrough in the ESXi interface). If you want to use NVIDIA GPU's, you'll actually install drivers in ESXi, and you'll be confined to the most expensive NVIDIA cards (Quadro 6000, 5000, 4000, or the Tesla or Grid cards). This is actually pretty cool, as you can spread the GPU's across multiple VM's for Virtual Desktop applications like CAD and the like. But splitting the power of a GPU card across multiple VM's defeats the whole point of building a VM for cracking. For my lab, I chose an AMD RADEON 7970 - it's got great processing power and it was on sale that week. The 7900's seem to be right at the knee of the curve, right where more processing power starts to cost you disproportionally more money. So, once all the prerequisites are in place, we're ready to go. 1/ First, install your card. 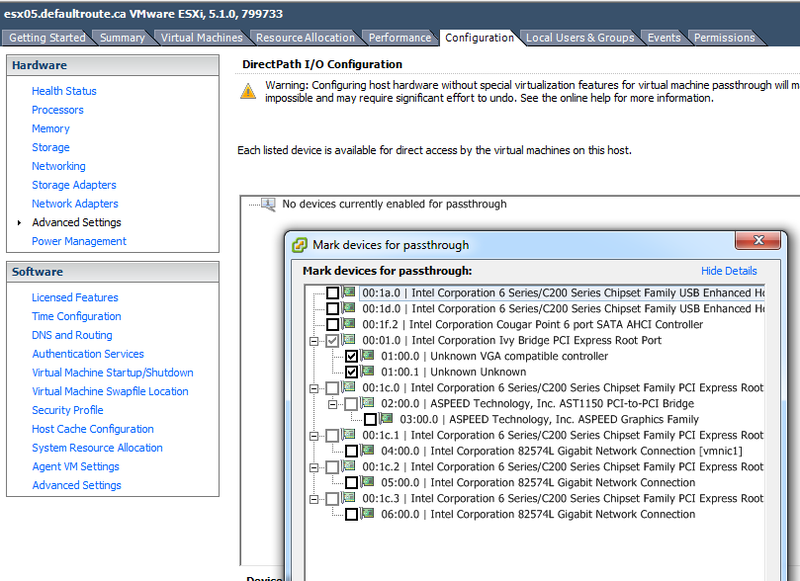 2/ Next, over to ESXi, we'll need to enable Device Passthrough (Vt-d) for our new device. You'll find this in Server Settings / Advanced / Edit. Select the new card (which also selects the PCIe slot that it's in), and save. You'll need to reboot the server after this done. 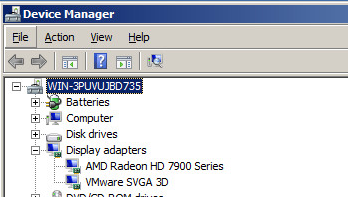 4/ After installing the correct AMD driver in the VM, and we see our card! I left the card at stock values for everything, nothing was overclocked or outside of the default settings. 5/ Next we'll need to install then the OpenCL SDK in the VM (Downloaded from AMD). At this point, you'll be able to use the processing power of the GPU in any app written for it - I'm using Hashcat and John the Ripper, they both work great! Running the hashcat benchmark (oclHashcat-lite64.exe -b) sees the card as a "Tahiti" (the codename for the 7900 series) gives us some really impressive numbers - for instance 8765.0M/s for MD5 (yes, that's in MILLION Hashes per second). While real throughput on the "no-lite" version will be slightly slower, these numbers are all pretty close to truth. Just for fun, I installed the identical setup on a similar but PHYSICAL machine (3.5 GHz i7 quard core, as poosed to the 3.3 Ghz XEON quad in my ESXi server). You can see from the table below that the throughput on hash calculations are very close, with the i7 setup a bit slower. It's in situations like this where you'll see the features in "server class" processors make a difference - things like larger CPU cache for instance. My ESXi server was running my kid's Minecraft server (with him and all his friends on it), plus we were streaming video off of another VM running DLNA services for our TV, and hashcat in the VM is still is consistently faster than the physical host running a workstation CPU of similar specs. Hashing and encryption algorithms have worked well in the past, as CPU power has increased, we've been able to stay ahead of the curve with better encryption (DES followed by 3DES then AES for instance). While you could always brute-force short strings like passwords, the additional computation involved in each successive algorithm meant that at any point in time, cracking the current algorithm on current hardware would take too long to be practical (unless you had nation-state budgets that is) - essentially this is Moore's Law in action. The power these new GPU cards bring to the table gives the hardware side of the equation a "leapfrog effect" - we're increasing the decryption capability by several orders of magnitude - by lots of zeros!. And I'm not seeing a fundamental shift on the other side, no new "1,000 or 1,000,000 times harder" algorithm that makes it "difficult enough" to make brute forcing passwords impractical. Our best defense today is longer passwords - this is an area where size does matter, and bigger is better. But what's really needed is an alternative to passwords, or a whole other method of storing them. MD5 and SHA1 should no longer be used to store passwords, EVER - with this kind of throughput available to attackers with even minimal budgets, it's just too easy to crack these still commonly used algorithms. You should be able to draw your own conclusions as to what's a better way to go (look towards the bottom of the list, or look at what's not on the list yet). PBKDF2 (RFC 2898) is not currently on HASHCAT's list of supported algorithms. This new algorithm isn't widely deployed yet, but it goal is to "eat" a much higher number of compute cycles, making it ideal for password storage (especially if SHA256 is used instead of the default SHA1). This may be our best bet for password storage, short term (I don't have benchmarks for it yet). We are however, seeing GPU support for this algorithm in John the Ripper.